Spring is coming and with it the new ranges are hitting the shop floors. I am a relatively new convert to Aldi because historically my husband does the food shopping. However many go to Aldi for way more than just the food shop. When I was at the Good Food Show Aldi was drawing the crowds with their food and drink ranges. I honestly couldn’t say a bad word about the drinks range. I have often stuck to premium brands because I believed it would be a false economy to but an Aldi version and then not enjoy it and have to go and buy the premium range anyway. However the taste testing proved me wrong and encouraged me to try other products too. Did you know Aldi is the UK’s joint fifth largest supermarket with over 690 stores and over 29,000 employees. The company has more than doubled its market share since 2010. The homewares are also scoring top points with shoppers who are always impressed with the special buys and home decor ranges. Those looking to spruce up their home this Spring need look no further thanks to Aldi’s brand new selection of stylish Spring Home pieces. From furniture and soft furnishings to lamps and ornaments, budding interior designers will find everything they need to give their home a fresh new look – available to pre-order online at www.aldi.co.uk from 9th February and to buy in stores on 16th February. 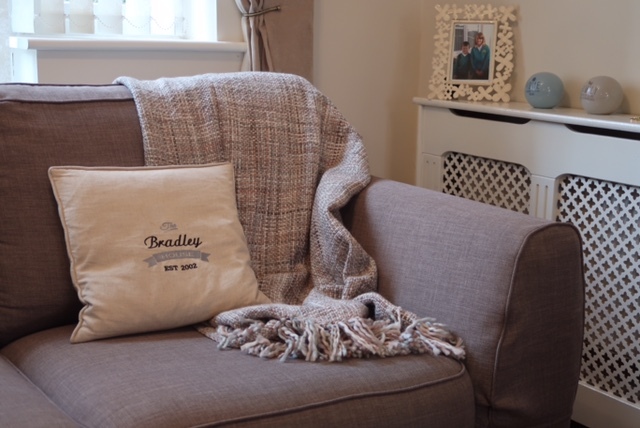 I was able to have a sneak peek at what will be available and was impressed especially with the throw which matches my colour scheme perfectly. 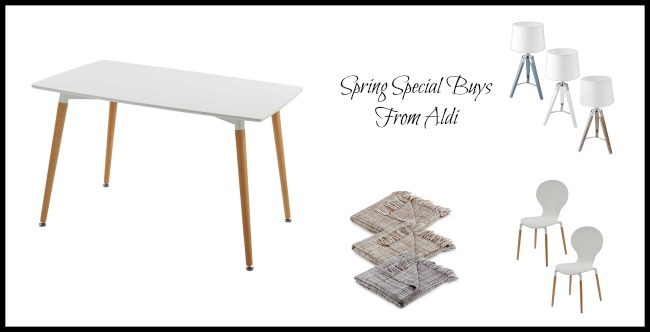 Additionally for an elegant look, Aldi’s Beechwood Dining Table (£59.99) is the perfect addition to any kitchen or dining room. It features a white finish table top and lacquered beechwood legs for a clean, modern look. Adjustable feet make it easy to counterbalance uneven floors, so the table can easily fit into any setting. Pair with the Beechwood Pair of Dining Chairs (£39.99) with a matching design to complete the classic beechwood theme. Continue the contemporary feel with a modern Tripod Floor Light (£49.99) or Tripod Table Light (£24.99), a stylish and effortless way to create ambiance in any room. With a wood and metal base, shoppers can choose from a grey, white and washed effect cloth shade. Nothing says elegance like a set of Velvet Top Curtains, available in sizes 90” x 90” (£34.99) and 66” x 72” (£24.99). With stylish faux silk and a velvet top border, these curtains will suit a variety of colour schemes with a choice of lavender, cream, grey and mint. This fun Spring Bean Cube/Pouffe (£14.99) can jazz up any living room. Choose from six quirky designs, including cute rabbits and ducks wearing wellies. For added comfort, Aldi’s Shaggy Rug (£14.99) is a treat for the feet as well as a feast for the eyes, available in cream, mint and grey with non-slip material for additional safety. Complete the look with Aldi’s Tonal Weave Throw (£16.99) and Spring Cushions (£5.99 each) to really bring the room to life. Add a touch of chic to the home with these Indoor Lanterns (£4.99), which feature a metal finish and glass panes. Pair with Antique Style Lightbulbs (£2.99) for the ultimate vintage look. Disclosure: I was gifted some items from the range for the post.